Your holiday brunch menu just got a lot easier with this recipe for a make-ahead Fireman’s Overnight Breakfast Casserole! Let’s start with the obvious question: what makes this a fireman’s casserole? 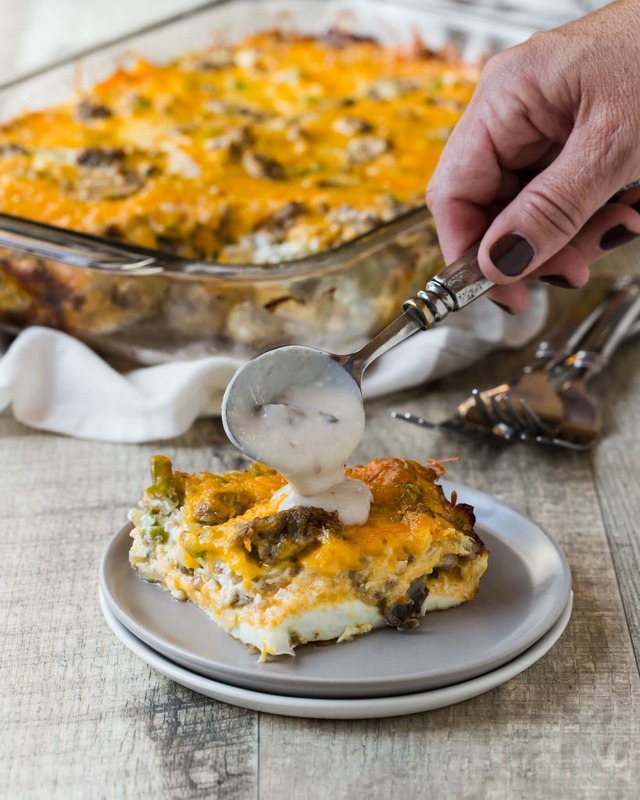 This Fireman’s Overnight Breakfast Casserole recipe is courtesy of my mother in law, Cathy, and it’s been a staple at family brunches for as long as I’ve been around (and that’s been almost 2 decades). She got the recipe from a community cookbook, so maybe we can assume it came from a fireman or fireman’s family?? Regardless of its origin, this overnight breakfast casserole recipe is a delicious, make-ahead option for any brunch – holiday or not. I totally get why Cathy relies on this recipe. Who wants to be stuck spending time the kitchen during the holidays? A few minutes of prep time the night before, and all you need to do is pop it in the oven an hour before guests arrive. It doesn’t get much easier than that. Ease of preparation is one thing, but let’s not forget flavor. The Fireman’s Overnight Breakfast Casserole doesn’t disappoint there, either. Tip: We love the flavor of an extra sharp cheddar cheese in this recipe, but feel free to sub in your favorite cheese if you prefer something different. 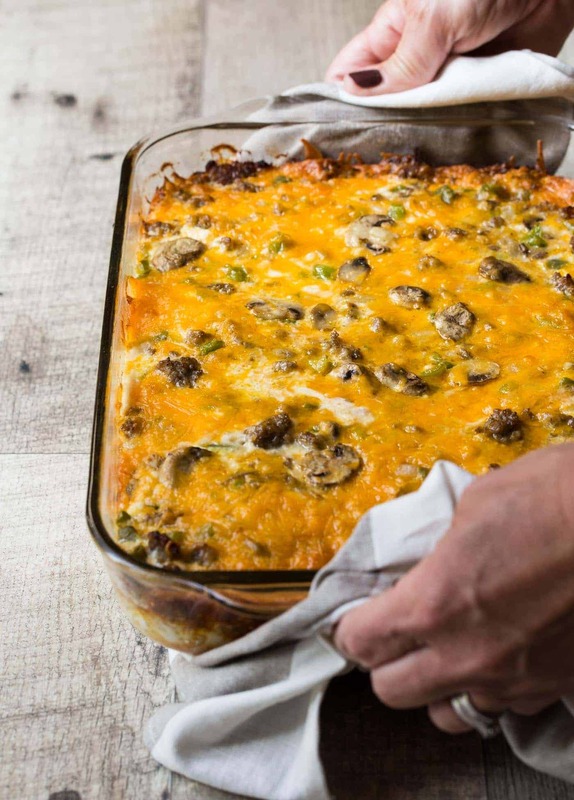 Keep your brunch menu stress-free during the holidays with this easy recipe for Fireman’s Overnight Breakfast Casserole! Check out our VIDEO to see how easy it is to make! Lightly grease a 9 x 13 baking dish. Set aside. Brown sausage in a skillet over medium heat. Drain meat. Add mushrooms, onion and green pepper to the same skillet. Stir and cook over medium heat for 6-7 minutes. Return meat to the pan, stir to combine and add salt and pepper to taste. Remove from heat. Break eggs into baking dish keeping the yolks intact. Do your best to evenly distribute the egg yolks around the pan. Poke a hole in each of the yolks with a toothpick. Pour cream over eggs and top with 1/2 of cheese. Using a slotted spoon, add sausage mixture to the baking dish. Top with remaining cheese, cover with foil and refrigerate overnight. When ready to bake, preheat oven to 350 degrees. Cook covered for 30 minutes and uncovered for another 30 minutes. Combine soup, milk and garlic powder in a small saucepan and cook until heated through. Add additional milk to reach desired consistency. Season to taste with salt and pepper. Serve with breakfast casserole. Recipes like this are so terrific for bringing to breakfast meetings at work or teacher appreciations – and so easy to make! I like any excuse for mushrooms in my meals, too!! I know I’d love to be on the receiving end of this casserole! We love breakfast casseroles! This looks fantastic! Thanks, Anna. We’re big fans, too. Woah. I’m suddenly starving. This sounds delicious!! Now you know how I feel when I visit your site, Aimee! Thanks, Heather. Breakfast casseroles make entertaining so much easier, don’t you think? There is nothing better than having a breakfast casserole that’s all ready to pop in the oven in the morning. This looks delicious! Couldn’t agree more, Renee. Makes getting out of bed a heckuva lot more enticing, too! We have breakfast casseroles for holiday breakfast/brunch, too! This one looks so good! Breakfast casseroles make me happy. I would much rather have this egg and sausage casserole for breakfast than pancakes or cold cereal. Love it! 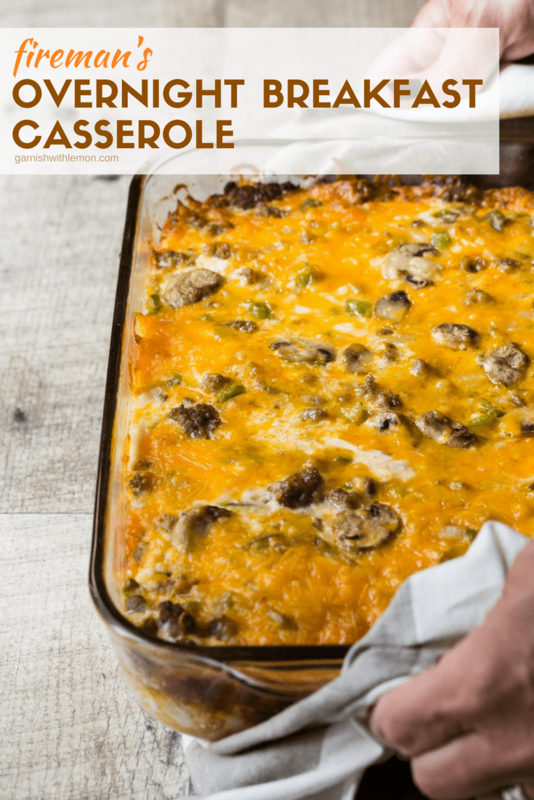 My husband doesn’t like too many breakfast casseroles, but this one with cream of mushroom sauce…I think he might reserve the whole pan! I love a breakfast casserole! This looks incredible! We love doing decadent brunches on holiday mornings, so anything we can prep ahead of time is great! Hi girls! I made this today and it was great! Even my girls loved it – great recipe, and always happy to have another breakfast casserole in my cookbook! Awesome, Erin! Thanks for stopping by to let us know. P.S. Love your site makeover! Would using normal breakfast gravy work for this recipe instead of the mushroom sauce? Or do you think it would throw it off? Hi Shelby, I’ve never made it with breakfast gravy, but it’s a pretty forgiving recipe. I say go for it! Please stop back and let us know how it turns out. I made this for brunch this morning. It got an 11 In a 1-10 rating from my family. So delicious! They requested I make it again, possibly for dinner sometime. Thank you for a winner of a recipe! I’m so glad you and your family enjoyed the recipe, Brenda! I’ll pass along the rave review to my mother-in-law. She’ll be thrilled. I’m going to put this together in the morning and have it for dinner! Breakfast for dinner is one of my favorites! Enjoy, Kristine! I told my husband what I was going to make for this morning. Unfortunately I told him 2 days ago. So yesterday, he kept checking on me. At 5 pm he asked me if I was still fixing breakfast. I told him I was, but it was for today. At that point he suggested we have pizza for dinner. While he was gone, I preheated the oven for the pizza and made the breakfast. When he pulled in I just had the top layer of cheese, aluminum foil, and the refrigerator placement to go. He was impressed! BTW, we love mushrooms so I almost doubled them. (Minus the raw ones we ate first.) The casserole is almost ready to go into the oven today, once it is up to heat. I’ll let you know how it was! Predicting a yum! Hope you enjoyed it, Carolyn! Can this be frozen after it’s cooked? I’m not sure. I’ve never tried. If you give it a go, let us know how it turns out! Why should you not whisk the eggs? Hi Vicky, that’s part of the unique nature of this dish. The eggs are not whisked. They bake into an eggy layer where the whites and yolks are somewhat separate. Does this have to set together overnight? Or can I put it together and bake all at once? Hi Katie, I’ve always made it the night before and baked it in the morning, but if you make and bake it immediately, please stop back and let us know how it worked for you. Thanks! This is a yummy breakfast. The one thing I would do differently is beak up the yolks more. I kept them intact and poked each yolk with a toothpick as in the recipe so when i baked it, the yolks cooked whole. I would break up the yolks and mix it up a bit more. Other than that, it was yummy. Glad you liked it, Jessica! Ever swapped out sausage for ham?…or add some green pepper? Hope to try soon. Hi Candy, I have added green peppers in the past but not ham. Let me know if you try it! Can substitute milk for cream? Hi Mary Ann, it should work fine, but I would suggest whole milk vs. skim/1%. Enjoy! Is this still good without the mushroom gravy, could you top with salsa instead?? It looks yummy! Hi Maryann, Yes, it’s still good without the gravy. Haven’t thought to add salsa, but would love to hear if you do!! Has anyone figured out the calories for this?